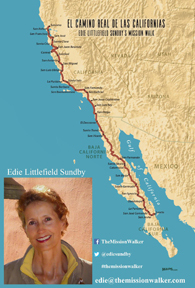 After losing her right lung to cancer, Edie became the first person in history to walk the El Camino Real de las Californias, from Loreto, Mexico to Sonoma, California. 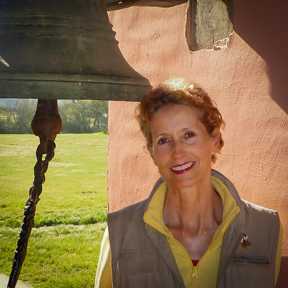 The old Spanish mission trail is unmapped and untrodden and so brutal that no one had ever attempted the entire 1,600-mile walk through the mountain wilderness of Baja Mexico and the Sonoran Desert to Northern California. Edie experienced desert heat and cold, walls of cactus, sleeplessness, hunger, both physical and spiritual exhaustion, the dangers of wild creatures, and encounters with drug smugglers—and weeks with no water other than what a pack mule could carry. The Mission Walker is her first-hand account of the experience and struggles she endured, and the inspiration she discovered. It is both an adventure story and a reflection on the universal experience of confronting our own mortality. It’s a story of what we can do when faced with the potential end of our life. What do we do with our time left on earth? And how much do we still really, truly want to live? 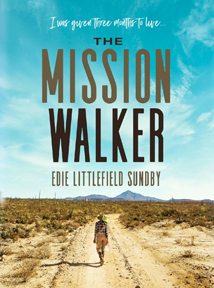 The Mission Walker is a 2018 Audie Award Finalist for “Best Inspirational Book.” Edie’s essays have been featured in the New York Times and Wall Street Journal.